Here is a collection of various questions asked by songwriters. If you have a question you want answer send it using the form below. While composing a song, do songwriters write the lyrics first, or the music? For several months I conducted a poll on the site to find out how songwriters start the songwriting process. This graph shows the results. What I learned from this is that most songwriters start with lyrics first. Followed by writing a chord progression. In third place was starting with a melody. What is the key to create great melodies? A song’s melody is perhaps the most important element of the song. The bedrock of music belongs to the melody. One of the most important aspects that make a great song lies in the melody. Melody is what makes a song memorable. The melody needs to be simple. This makes it easy for the listener to remember. A complicated melody may alienate the average listener. The key to writing a great song means making a memorable impact on the listener. What is the difference between a songwriter and a lyricist? All songs consist of words and music. The words to a song are the lyrics. The music in a song is the melody. Someone who writes the words are called a lyricist. A person who writes the melody is called the composer. Both the lyricist and the composer are songwriters. What is the definition of melody in a song? A melody is a sequence of single notes that is musically satisfying. Any series of single tone creates a melody. The human voice, the flute, horn,—all instruments capable of emitting but one tone at a time. Each of these instruments produces a melody. Melody constitutes, then, a line of tones. The quality of the melody depends upon the choice and duration of each successive tone. A good melody is one that appeals to the music lover as tuneful, pleasing, and intelligible. It is one where each successive tone and each successive group of tones stands in a rational harmonic relation to the one before it, and even, usually, to several preceding tones or groups. To say it another way, the tones are not arranged haphazard, but with reference to their harmonious agreement with each other. What is a good way to get started songwriting? The first thing you need is to have an idea or concept for a song. From that brainstorm as many ideas as you can that relate to the idea. Once you finish brainstorming you can then pick and choose the best ideas and build from there. Start creating a chorus. This is help you write the verses. What elements makes a melody memorable? The thing that makes a melody memorable is the repetition of the motif or musical phase. The motif is a small musical phase that is used throughout a melody. By repeating the main motif it “embeds” the melody into the listeners ear. Think of it this way. If you want to learn how to do something real well. You will practice what ever moves or actions required to master that skill. In effect its the repetition that build a strong memory on how to perform it. The same is with a melody. By repeating a motif of phase several times will help the listener better remember the melody. What are some of the element of a hit song? The song chosen to be a “hit” will 99% comply with a radio friendly format. There are several elements of a radio friendly format. These are some of criteria you can use to discover the best hit song. The song length needs to be 3-4 minutes. The intro should only be 4 bars maximum. The song’s chorus should arrive before 60 seconds pass. Lyrics should be universal in order to appeal to a larger audience. The melody needs to be simple and memorable. Make certain that the chorus stand out from the verse by using creative contrast. The hook in 95% of the time will be the title. The hook title needs a great melody behind it. Repeat the hook as much as you can get away with doing. Make sure the lyrics tell a story. Watch for grammar mistakes. i.e. verb tense, pronoun usage. Most people can tell when a song is great. Tap into that feeling. 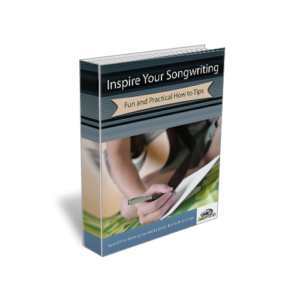 What are some important aspects of the songwriting process? Songwriting involves several disciplines. These include the ability to write a good story. Take that story an turn it into lyrics. The lyric need to have meter and rhyme. Then the words are fused with a melody. Therefore it’s important to write music. A knowledge of music theory is helpful in creating chord progressions. Then the song needs to take some sort of form like: Verse-Chorus-Verse-Chorus. Then there is the production where the song is recorded. Each of these elements come together in create a song. What are some good daily songwriting routines that work for you? The most important thing to do is make a daily appointment with yourself. Keep that appointment everyday. This will create consistency and momentum in your writing. But what to do? Here are a few things to add to the daily routine. Start a new song. If you have an idea book, use that that to begin writing. Create a title, write lyrics, melody add a chord progression and give the song a form. Work on existing songs. It is a rare that a song is done in one day. Take an existing song and rework and rewrite it. Make tweaks to the lyrics, melody, chords and form. Make the song better. Finish a song. Know when a song is complete and finish it. These are just a few things you can do during your daily songwriting routine. What are some common mistakes that first-time songwriters make? How many songwriters does it take to write a hit song? The number of songwriters needed for a hit song is as many as it takes. That could be one or seven depending on the circumstances. Now let’s ask how many people does it take to make a hit movie? Just saw Iron Man Three. I like to sit through the credits. There must have been literally a thousand or more people to make that movie. But that is what it took to get it out. The same is with a song. The seventh songwriter, no matter what their contribution was needed to get the song out. Breaking down other musicians to make yourself feel better will only do two things. 1) Isolate yourself from being able to possibly learn from them (Just about every band has at least one good thing about them.) 2) Every time you break down another musician, it will make it easier to do it again. This could eventually lead you to become that one bitter guy that no one likes to hang with. If you’re a musician you should be writing music because you love to write music. So stop comparing other people. See if you can learn something and move on. You owe it to yourself to not let your ego get in the way.